Finding a bump, rash, red mark, or welt on a child's body is more common than not finding one. Most of these are not worrisome; however, some may be more concerning than others. We will present some information about common skin findings in this slide presentation to help patient's better identify them. As always, if there is any concern, always consult the child's doctor to be sure. 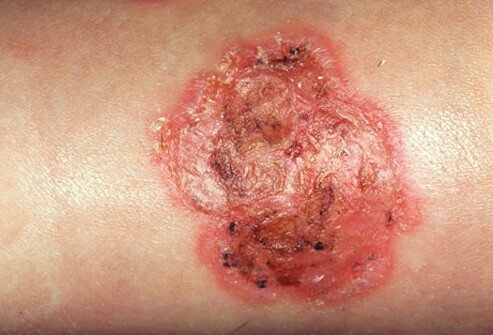 Ringworm has nothing to do with worms. 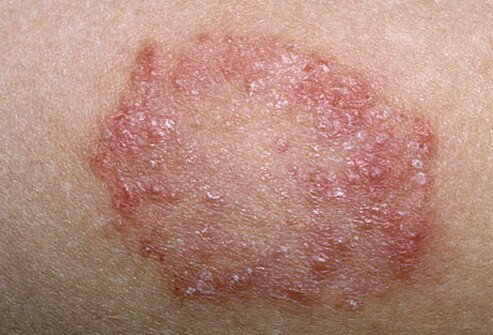 The cause of ringworm is a common fungus that infects the skin and causes a scaly and bumpy red patch to form on the infected area. It is highly contagious, and ringworm can spread by contact or by sharing clothes that have also come in contact with the infected area. Generally, the treatment is to apply an antifungal cream to the area for a prolonged period until the infection resolves. Parvovirus B19 is the virus that causes fifth disease. It is a very common illness that is usually mild and resolves without treatment. It typically starts with flu-like symptoms. 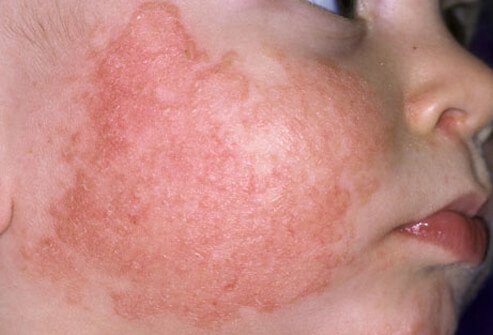 A bright red rash on the cheeks ("slapped cheek appearance") and a rash on the body follow. Since a virus causes fifth disease, antibiotics play no role in the treatment. Parvovirus B19 can be dangerous to pregnant women, so it's important to notify a health-care professional in the case of exposure. Chickenpox used to be an extremely common infection amongst young children, but today we see it much less frequently due to universal vaccination programs. An infection with varicella, the virus that causes chickenpox, generally starts as a fever, and then cold symptoms and the rash develop. The rash is itchy and generally appears as a mix of blisters, spots, and crusted scabs; it lasts for a little more than a week. 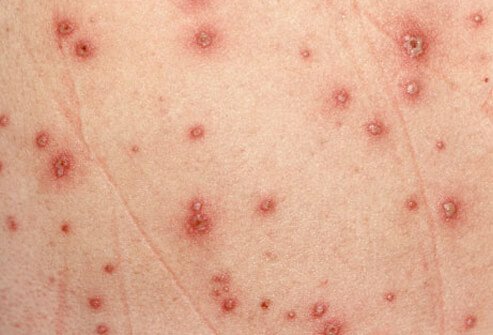 Children with an active chickenpox infection are contagious until all of the blisters crust over. Impetigo can be confused with other skin infections, including cellulitis (a deeper infection) and even ringworm. 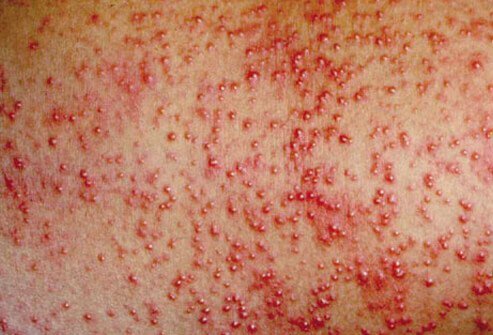 Common bacteria found on the skin cause impetigo, and antibiotics easily treat impetigo. 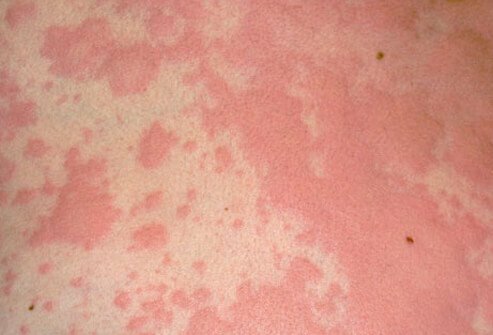 The rash itself looks oozy, blistery, and red initially and then may develop a yellowish crust. It spreads by contact, and scratching makes it worse. Impetigo can occur anywhere on the body, but it's commonly found around the mouth and nose. A virus causes warts. Warts can spread both from person to person and to other parts of the body. Most commonly, warts appear on the hands, but they can be found anywhere. Most resolve on their own, but there are over-the-counter preparations available to accelerate resolution. Young babies often get heat rash. Blocked sweat glands cause heat rash, which results in a red pimply eruption on the head and neck. It's important to dress your infant appropriately (not too hot and not too cold) to prevent the eruption. Generally, heat rash resolves on its own. Contact dermatitis appears as a collection of small red pimples or bumps on a skin surface exposed to some sort of allergen. This can be due to specific foods, lotions, chemicals, or plants, such as poison ivy. The rash starts within one to two days of exposure, depending upon the sensitivity and can last for as long as the contact continues or until it heals, which may take one to two weeks. Topical antihistamines or steroids may decrease the symptoms. 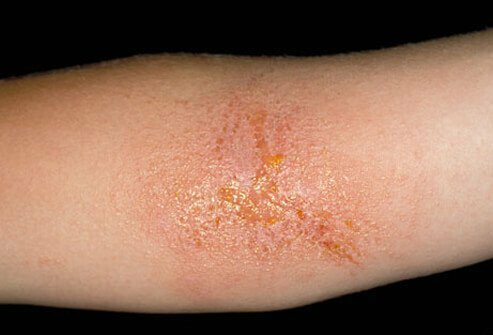 Frequently, people confuse contact dermatitis with a skin infection, such as impetigo. Coxsackievirus is the cause of hand, foot, and mouth disease. It is an extremely common childhood infection, especially during the summer and early fall. 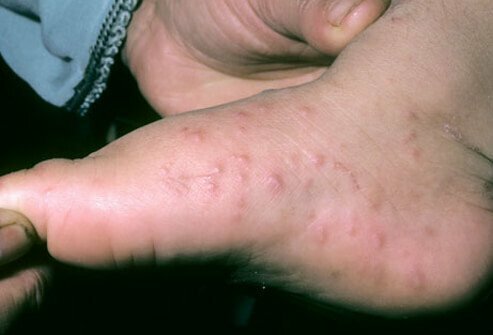 It usually starts with fever and then develops into a non-itchy rash involving the body, including the hands and feet; it also causes mouth sores. The mouth sores are painful and can interfere with eating and drinking in some cases. It is extremely contagious, and like many viral infections, it spreads through contact, often by coughing and sneezing. Hand, foot, and mouth disease resolves on its own within a week. Eczema, also known as atopic dermatitis, is common in children with allergies and asthma. 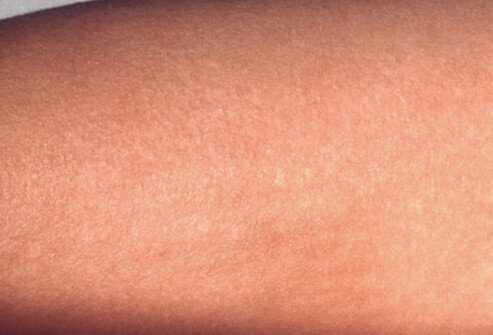 The rash appears as an itchy red patch, which may show up anywhere, but it typically shows up on the cheeks, elbow area, or around the knees. Using lubricating lotions, ointments, or creams usually improves the symptoms, but sometimes topical steroids are required. Hives are the result of an allergic reaction. They appear as small red itchy bumps or welts, which may be painful as well. Exposure to an allergen, such as a food or medicine, may cause hives. Some common allergies include nuts, eggs, and shellfish, but certain viruses can also cause hives. Although hives alone are not dangerous, if your child develops breathing troubles, including cough and wheezing along with the hives, it might signal a more serious allergic reaction requiring immediate medical attention. Antihistamines are the standard treatment for hives. Streptococcal infection causes scarlet fever, a very common illness that begins with a sore throat, fever, and other nonspecific complaints. The rash, which starts after the other symptoms, feels like sandpaper and may or may not be itchy. Scarlet fever is very contagious, and although it will resolve on its own, it is necessary to treat the underlying strep infection with antibiotics. 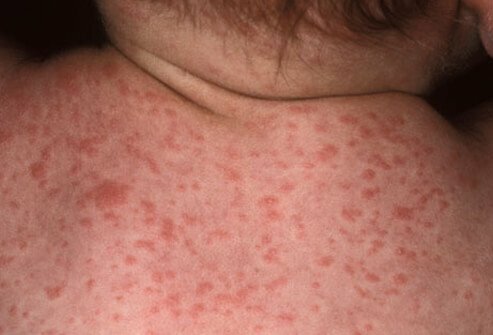 Roseola is a mild viral illness. The infection commonly appears in infants and starts with a very high fever, followed by a non-itchy rash with a lacy appearance. The fever lasts for a couple of days and then resolves; typically, the fever and rash are not present at the same time. The rash appears on the chest or back first and then spreads to the rest of the body. Occasionally, the fever can trigger a seizure, but most commonly it does not. Tom Myers / Photo Researchers, Inc.
© Scott Camazine / Phototake -- All rights reserved. 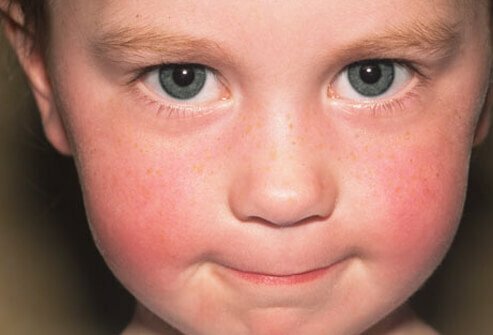 American Academy of Pediatrics: "Parvovirus B19 (Erythema Infectiosum, Fifth Disease"
Pediatric Emergency Care: "Topical Therapies for Impetigo"